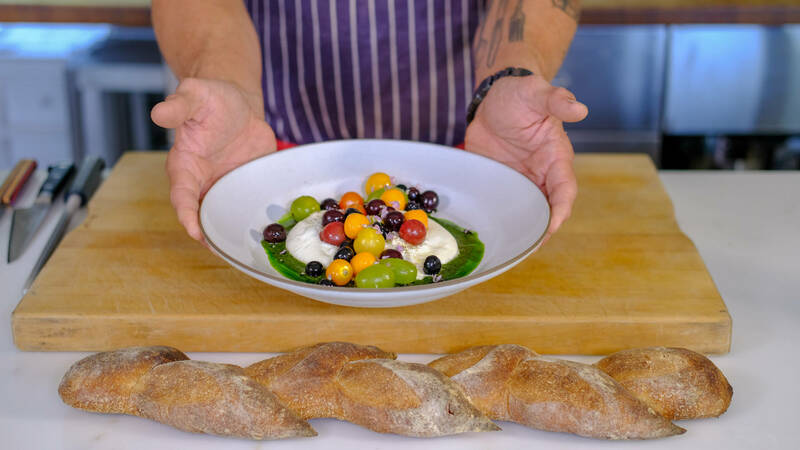 Burrata is one of those wonderful ingredients that people love to order in restaurants but don’t always know what to do with it at home. My salad makes for a luxurious lunch or appetizer to share. It’s a flavorful, colorful, pretty and easy to assemble salad (using the best fruit in season) that contrasts beautifully with my simple but delicious mitsuba pesto. Burrata is a pillow of fresh mozzarella filled with curds, or stracciatella, and cream making it soft, rich and buttery. The name burrata actually translates as “buttery” in Italian, and its origins are from the Apulia region of Italy. In Italy, it is often found wrapped in asphodel leaves, and fresh green leaves indicate the freshness of the cheese. Here in the US, we tend to find it wrapped in plastic. Eat your burrata within 48 hours of purchase for the best, freshest flavor. I love the flavor of mitsuba which is sometimes known as Japanese parsley. 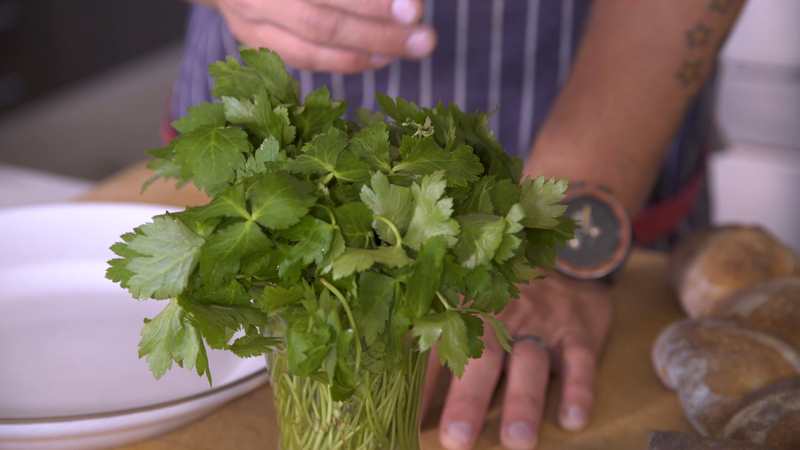 It is said to have a subtle flavor mix of Italian parsley and celery leaves, although it really isn’t related to either. Every part of the plant — leaves, stems, seeds, and roots — is edible and it’s enjoyed in a variety of dishes in Japan. Add it fresh and don’t cook it too long or it will become bitter. In a large bowl combine the grapes, tomatoes, gooseberries, and blueberries. In a small bowl, whisk the lemon juice, vinegar, salt, and pepper together. Drizzle in the oil, whisking lightly to combine. Spoon 2 or 3 tablespoons of the vinaigrette over the fruit and stir to coat lightly. To serve: Spoon about ¼ cup of the pesto onto two large plates, and gently place the burrata on top. Using a sharp knife, carefully cut the surface of the cheese to expose the creamy interior. Season each cheese with salt and pepper. Spoon half of the dressed fruit mixture on top and scatter chive blossoms over the fruit. Serve immediately. In a large pot of boiling salted water, blanch the mitsuba leaves until the water just comes back to a boil, but no longer than about 30 seconds. Transfer the leaves to a bowl of salted ice water. Remove from the ice water and squeeze out all excess moisture. In a blender, combine the blanched mitsuba, half of the oil, salt and pepper. Blend until reduced to a paste, then slowly drizzle in the remaining oil until the pesto is smooth and emulsified. Store in a sealed glass container and refrigerate. Good for up to 3 days. Just as a winemaker blends wine from different grapes to make fine wine, some olive oils are blended from several olive varieties to make a blended oil. Other olive oil producers press oils from a single estate or a single olive variety making a monocultivar olive oil. Some of these artisanal, single-estate oils are made in small quantities and are among the world’s best. 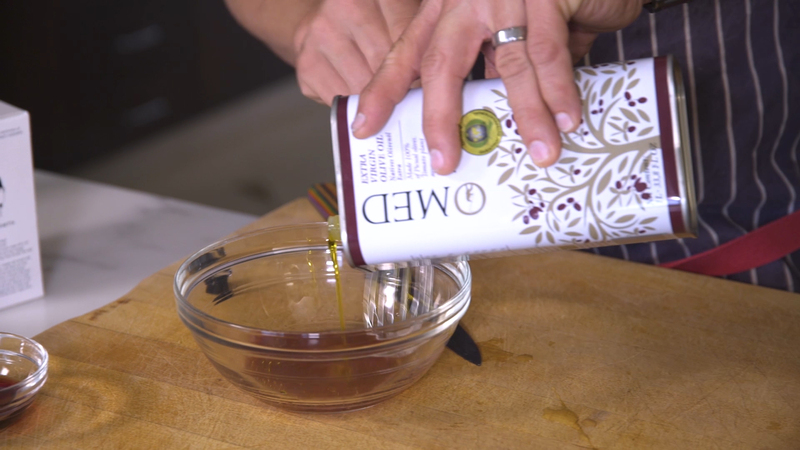 When buying olive oil you should know that not all olive oils are created equal. Terroir or place of growth, treatment and handling make for different qualities and flavors. First, Extra Virgin Olive Oil is the finest grade — it means that the oil was made from the first pressing, usually cold pressed. Virgin Olive Oil is, for all purposes, the same as Extra Virgin Olive Oil but has a higher acidity although it must be below 4%. Fine Virgin Oil, Superfine Oil, Olive Oil, and Pure Olive Oil are all lesser grade oils and can be used for cooking. Fruitiness: Should have the aroma of fresh fruit with a fresh and fruity smell. Bitterness: Olives are bitter when first picked from the tree. So often fresh, high-quality olive oil has a bitter element. Pungency: is that cough-inducing sting at the back of the throat. It’s caused by the phenolic compounds iin the olive oil. High quality oil has more of these compounds. Complexity: The best olive oils smell and taste complex evoking a veritable bouquet. Harmony: The best oils are balanced reflecting fruit, bitter and pungent flavors without any one dominating. Persistence: The best oil, like wine lingers on the palate reflecting all of the subtleties in the oil. Choose olive oil carefully, reserving the very best for drizzling over dishes.